If you are looking for the best graphics card under 50 dollars budget then just keep on reading. Graphics cards under 50 dollars are not meant for gaming and they are generally used for onboard graphics replacement and for basic tasks like photo editing, video editing, HD video playback etc. They can be used to play older games like Counter Strike, Max Payne 2, Far Cry, COD etc at decent graphics settings and screen resolution. Also they may lead to the performance increase of your PC as there will be a dedicated GPU for graphics processing and CPU will be free from that. 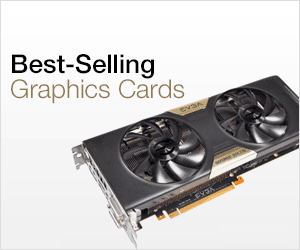 You can also check out various advantages of graphics card. You must know that even a cheap video card under 50 dollars can be more powerful than the onboard graphics and it can really increase the graphics performance and overall performance of your PC. If you have slightly more budget then you can also look at the list of best graphics cards under 100 dollars but here I am going to provide you the list of best graphic cards under 50 dollars from Nvidia and AMD. These graphics cards have lower power consumption and does not require external power from the PSU. Here are the best Nvidia video cards under 50 dollars budget. This is the most basic and cheapest graphics card available under 50 dollars budget. It is a low profile graphics card and is not known for its gaming ability. This is a good card if you want to replace your outdated onboard graphics on an old computer with a better one and want DVI and HDMI display ports. This low profile graphics card comes with passive cooling and occupies only a single slot. The absence of fan makes the card completely silent in operation. This card is equipped with 1GB DDR3 memory and can be used for basic photo editing and video editing work, watching HD movies and playing relatively older games like Max Payne, Max Payne 2, Counter Strike, Half Life etc. This card even supports the latest Windows 10 operating system, Linux and you can check it out from the link given below. GeForce GT 420 is a more powerful graphics card than GeForce 210. It comes with 48 CUDA Cores and 2GB DDR3 memory that is more than enough for normal tasks and definitely better than older onboard graphics. It can be used for light gaming, watching HD videos, video and photo editing. It is a good card if you want to upgrade the onboard graphics of your older PC. Also you can play older games at decent settings on this low budget graphics card. This card has good cooling and comes with a heatsink and fan. It comes with all the required display connectors that include VGA, DVI and HDMI. It supports Windows 10, Linux and Ubuntu. The only thing that you should keep in mind when using it with Windows 10 is to install the latest Nvidia GeForce drivers from the Nvidia’s official website. This is one of the newest budget graphics cards that you can buy under 50 dollars. It comes with 48 CUDA cores and 2GB DDR3 memory. 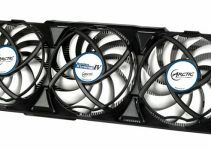 This is a low profile card but comes with active cooling solution with a fan and heatsink. It is a fairly powerful card and you can play games like GTA 4, Fallout 3, Far Cry 2, Diablo II, Dishonored, Oblivion, Skyrim etc. on low-medium setting at 720p or HD resolution. This is a great card if you are building a multimedia PC or want to upgrade onboard graphics to something better. It supports Windows 7/8/10 and Linux very well. It comes with all the popular display ports that include VGA, DVI and HDMI. You may get this little graphics card under 50 dollars or so. 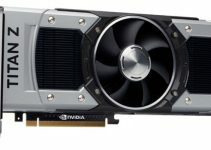 GeForce GT 710 is the most powerful graphics card under 50 dollars from Nvidia. It is a relatively newer card as compared to others in this list. This card comes with 192 CUDA Cores which is way more than other graphics cards in this 50 dollars budget. This is a low profile graphics card and comes with passive cooling solution or fanless cooling making the card totally silent in operation. This card has the biggest gaming potential in this price segment and you can play games like Fallout 3, GTA 4, Splinter Cell series, Skyrim, Call of Duty 4, Resident Evil 4 etc. on decent settings and with playable frame rates. The card is compatible with Windows 10 and Linux. The power consumption of GT 710 is also very low and you can get it a best price from below. Here are the best AMD graphics cards under 50 dollars budget. Radeon HD 6450 is a en entry level and low-end graphics card from AMD under 50 dollars. 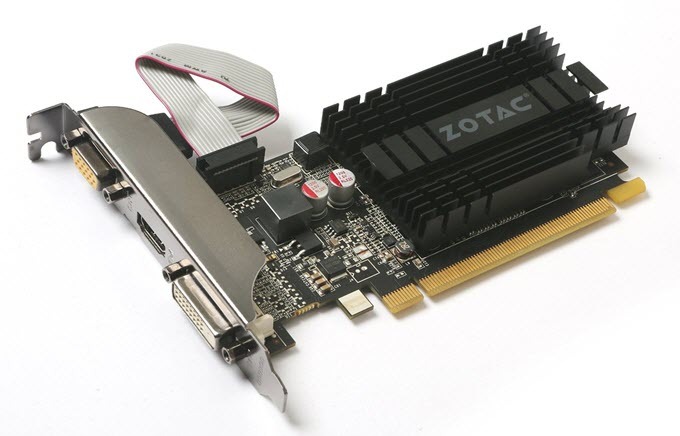 The performance of this card is comparable to that of GT 610 from Nvidia. It is a low profile card and comes with active cooling solution. It is a wonderful card for older PCs and can be used for setting up multiple monitors, photo and video editing, light gaming. It can run games like COD, CS, Far cry, Skyrim, Splinter Cell 2, Assassins creed etc. pretty well at playable frame rates. The only negative side is that it does not support DirectX 12 whereas GT 610 does. The power consumption of this card is very low at 18W. MSI Radeon HD 6450 is even cheaper than the GT 610. Radeon R5 230 is a rebranded HD 6450 and comes with same 160 Stream Processing Units but has got lower memory speed. Here we have Gigabyte Radeon R5 230 that comes with 1GB DDR3 memory (64-bit bus width). This is a single slot low profile graphics card and is great for multiple monitor setup and for use in HTPC or in older PCs. You may be able to play very old and less demanding games on this graphics card e.g. Far cry, Splinter Cell, Cold Fear, Counter Strike etc. 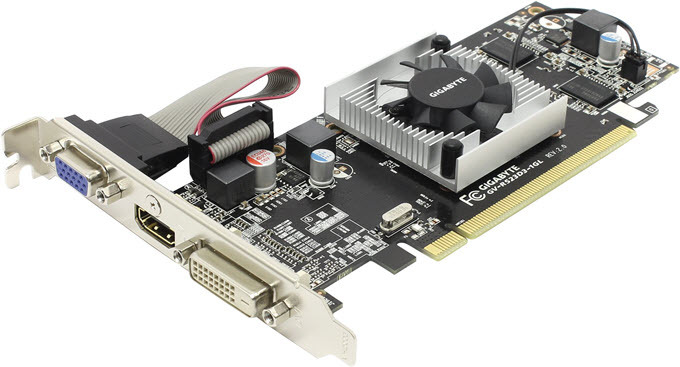 The performance of this card is comparable to that of GeForce GT 420 from Nvidia. The card supports DirectX 11 and OpenGL 4.1. It has lower power consumption and gets all its power from the PCIe x16 slot. The recommend PSU for this card is 400W only. Connectivity options include VGA, DVI and HDMI ports. AMD Radeon R5 240 is the most powerful graphics card under 50 dollars right now. It comes with 384 Stream Processing Units and 1GB DDR3 memory having 64-bit interface. This is a low profile and single slot graphics card and comes with active cooling comprises of heatsink and fan. This card is faster than the GeForce GT 710 from Nvidia. 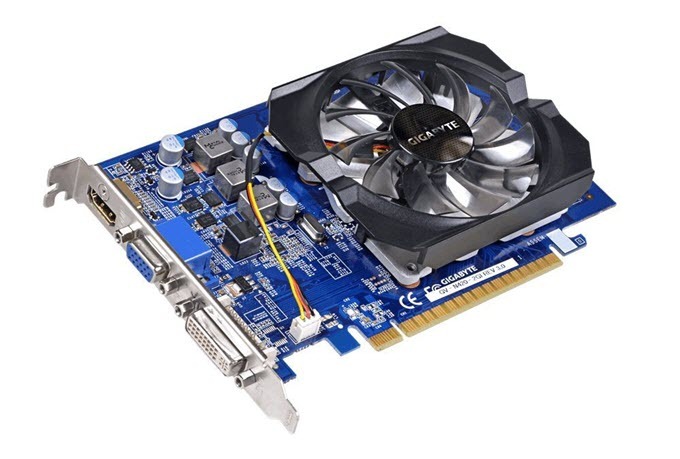 This card can be used to play much older games like counter strike, GTA 4, setting up dual monitor setup, or for use in older computers or for building a cheap HTPC. 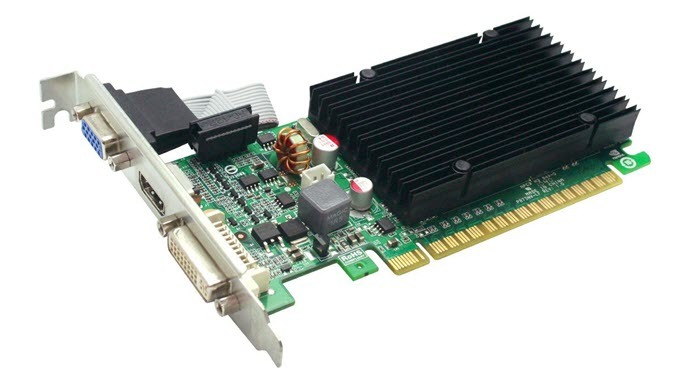 The card draws all its power from the PCI-E x16 slot and does not require external PCIe power connectors. You need full sized bracket to use this card in regular or standard cases as it comes with low profile bracket pre-installed from the manufacturer. 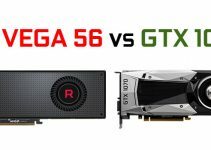 Well at the end I would like to say that if you are looking for the best graphics card under 50 dollars then you cannot find a better one than the those listed above in this post. Nvidia do offers much wider range and variety as compared to AMD in ultra low budget graphics cards segment. If you have queries regarding these graphics cards then you can ask me by leaving a comment below. hello, me some issues living i computer by. another pc case motherboard on graphic driver no. so, motherboard in incomplete material have. (graphic driver of model & name the knowing i didnt.) model the which im not sure? already monitor cord being not. monitor cord where plugging im? I did not get you. Can you explain the issue clearly ? I have a 400W PSU, Intel core 2 duo e7200 , and 6gb ddr2 ram . I was looking forward to buy a GPU in the range of 6000INR ( for gaming purposes). Which GPu would u suggest ( considering its benchmarks , specs and power requirement). Upgrade your RAM because you already have a low end graphics card in your PC. I want to get average 60fps on fortnite. And I want a low power graphics card. Also I want it to fit in my mini Itx case.